The very first update in the series is about GNOME Shell and Mutter. I’ve been increasingly involved with the development of those two core components of GNOME, and recently this has been the focus of my development time. Fortunately, Endless allows me to use part of my work time to improve it. Naturally, I prioritize my upstream work considering what will impact Endless OS the most. So far, that lead to a series of very nice improvements to Mutter and GNOME Shell. Most of my work time dedicated to GNOME Shell was oriented to performance and cleanup. At Endless, we have a modified GNOME Shell that constantly needs to be rebased. Since I’m taking care of these rebases now, it makes sense for me to also make myself familiar with the vanilla GNOME Shell codebase. I’ll start with the work that makes me the proudest: removing the Shell.GenericContainer class. For that reason, GNOME Shell developers created ShellGenericContainer: an actor that sends signals for various virtual functions. Because GJS supports signals, that worked well. 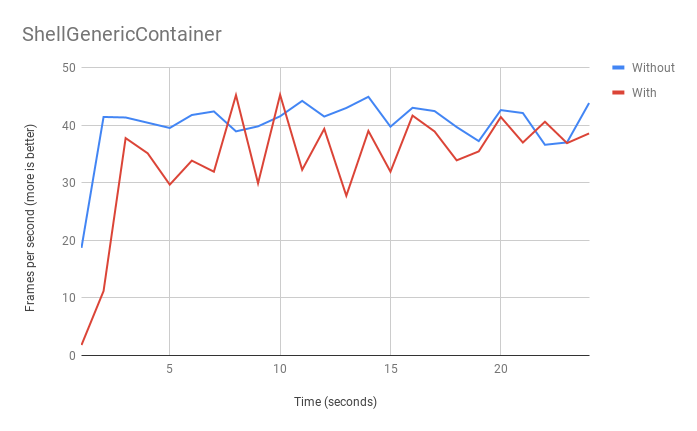 In general, running GNOME Shell without Shell.GenericContainer (blue line) led to more stable framerates compared to the current state (red line). This is now merged and will be available with GNOME Shell 3.32, to be released on March 2019. After various investigations, another potential improvement that showed up was on StTextureCache. Textures (icons, image files, etc) are cached in GNOME Shell by StTextureCache, and that happened by keeping a ClutterTexture object alive. That turned out to be a problem. ClutterTexture is deprecated. Clutter has a new interface for drawing the contents of an actor: ClutterContent. It does not necessarily make the code faster, but it allows different actors to share a single ClutterContent without having to override ClutterActor.paint(). In other words, it is a nice and sane abstraction layer to control what an actor is drawing. So I went ahead and wiped out ClutterTexture from StTextureCache. Then wiped it out entirely from GNOME Shell. Unexpectedly, it made a small but noticeable difference! Icons are now slightly faster to load, but the most visible impact was in the startup animation. I did not know how fun and exciting compositors could be. It definitely is a new passion of mine, working on Mutter! So much has happened that it’ll be hard to summarize. During last year’s GUADEC, Jonas Ådahl worked on a Meson port of Mutter. After a series of reviews, and a few follow-up fixes, it reached almost complete feature parity with Autotools – the only exception being installed tests. So I went ahead and added installed tests to the Meson build too. Naturally, builds are much faster now. Saving us a few minutes per day. Another area that was interesting to work on was untangling X11-specific code from Wayland, and vice-versa. There are a handful of developers working on that already, and I had my fair share in better splitting X11 and Wayland code paths in Mutter. Specifically, I worked on splitting X11-specific code from MetaWindowActor into subclasses. Mutter already handles different surfaces correctly; on X11 sessions, all surfaces are MetaSurfaceActorX11, and under Wayland, MetaSurfaceActorWayland. MetaWindowActor has now the same split: Wayland windows have a MetaWindowActorWayland associated, while X11 windows have MetaWindowActorX11. Example of a Xwayland window; it has a MetaSurfaceActorWayland surface, and a MetaWindowActorX11 actor associated. There’s a lot more happening in this front, but I’ll spare the words for now. You’ll hear more about it in the future (and not necessarily from me). More recently, I’ve been experimenting with the Cogl journal and ironing out a few bugs that are preventing a completely CPU-side picking implementation. Picking is the process to figure out which element is beneath the cursor. There are two big approaches: geometry-based, and color-based. On games, the latter is the usual approach: each object in the scene is drawn with a plain color, and the final image is read to find out the color beneath a point. Geometry-based picking is what browsers usually do, and it’s basically math around rectangles. Clutter uses color-based picking, but has a nice feature around that: a journal that tracks drawing operations and, under some conditions, hits an optimized path and does geometry-based picking. This is interesting for Mutter and GNOME Shell because it avoids sending draw operations to the GPU unecessarily when picking, reducing resource usage. Unfortunately, due to various bugs and implementation details, we do not hit this optimization, causing GPU commands to be issued when they could be avoided. Figuring out these bugs is what I’ve been experimenting with lately. There’s much more that happened, so I will probably do a part 2 of this article soon. But those are big points already, and the post is becoming lengthy. Many of these experiments and investigations already landed, and will be available with GNOME 3.32. This is all valuable work that is partially sponsored by my employer, Endless, and I’m happy to keep working on it! This year, I had the pleasure to attend GUADEC at Almeria, Spain. Lots of things happened, and I believe some of them are important to be shared with the greater community. This year’s GUADEC happened in Almería, Spain. It turns out Almería is a lovely city! Small and safe, locals were friendly and I managed to find pretty good vegan food with my broken Spanish. I was particularly happy whenever locals noticed my struggle with the language, and helped and taught me some handy words. This alone was worth the entire trip! Getting there was slightly complicated: there were no direct flights, nor single-connection routes, to there. I ended up having to get a 4 connection route to there, and it was somewhat exhausting. Apparently other people also had troublesome journeys there. To me, the BoFs were the best part of this year’s GUADEC. The number of things that happened, the hard talks we’ve made, they all were extremely valuable. I think I made a good selection of BoFs to attend, because the ones I attended were interesting and valuable. Decisions were made, discussions were held, and overall it was productive. I was particularly involved in five major areas: GNOME Shell & Mutter, GJS, GTK, GNOME Settings, and GNOME To Do. A big cleanup was merged during GUADEC. This probably will mean small adaptations in extensions, but I don’t particularly think it’s groundbreaking. At the second BoF day, me and Jonas Ådahl dived into the Remote Desktop on Wayland work to figure out a few bugs we were having. Fortunately, Pipewire devs were present and we figured out some deadlocks into the code. Jonas also gave a small lecture on how the KMS-based renderer of Wayland’s code path works (thanks! ), and I feel I’m more educated in that somewhat complex part of the code. As of today, Carlos Garnacho’s paint volume rework was merged too, after extensive months of testing. It was a high-impact work, and certainly reduces Mutter’s CPU usage on certain situations. At the very last day, we talked about various ideas for further performance improvements and cleanups on Mutter and GNOME Shell. I myself am on the last steps of working on one of these ideas, and will write about it later. Exciting times for GNOME Shell ahead! The git master GJS received a bunch of memory optimizations. In my very informal testing, I could measure a systematic 25~33% reduce in the memory usage of every GJS-based application (Maps, Polari and GNOME Shell). However, I can’t guarantee the precisions of these results. They’re just casual observations. Unfortunately, this rework was making GNOME Shell crash immediately on startup. Philip Chimento tricked me into fixing that issue, and so this happened! I’m very happy with the result, and looks like it’ll be an exciting release for GJS too! Thanks Philip for helping me deep dive into the code. Matthias already wrote an excellent write-up about the GTK BoF, and I won’t duplicate it. Check his blog post if you want to learn more about what was discussed, and what was decided. Maintainership: GNOME Settings has a shared maintainership model with different levels of power. We’ll add all the maintainers to the DOAP file so that anyone knows who to ping when opening a merge request against GNOME Settings. GitLab: we want to finish the move to GitLab, so we’ll do like other big modules and triage Bugzilla bugs before moving them to GitLab. With that, the GitLab migration will be over. Offloading Services to Systemd: Iain Lane has been working on starting sessions with systemd, and that means that we’ll be able to drop a bunch of code from GNOME Settings Daemon. Future Plans: we’ve spent a good portion of this cycle cleaning up code. Before the final stable release, we’ll need to do some extensive testing on GNOME Settings. A bit of help from tech enthusiasts would be fantastic! We should all thank Robert Ancell for proposing and organizing this BoF. It was important to get together and make some decisions for once! Also, thanks Bastien for being present and elucidating our problems with historical context – it certainly wouldn’t be the same without you! Tobias’ GNOME To Do mockups in my engineering notebook. It’s fantastic to see how GNOME To Do is gaining momentum these days. I certainly did not expect it three years ago, when I bootstrapped it as a small app to help me deal with my Google Summer of Code project on Nautilus. It’s just getting out of control. Even though I was reluctant to go, this GUADEC turned out to be an excellent and productive event. Thanks for all the organizers and volunteers that worked hard on making it happen – you all deserve a drink and a hug! I was proudly sponsored by the GNOME Foundation. at this point, I think it’s safe to assume that many of you already heard of a memory leak that was plaguing GNOME Shell. Well, as of yesterday, the two GitLab’s MRs that help fixing that issue were merged, and will be available in the next GNOME version. The fixes are being considered for backporting to GNOME 3.28 – after making sure they work as expected and don’t break your computer. First, I’d like to thank the GJS maintainer, Philip C., for all the hand-holding, the reviews, and the incredibly insightful discussions we had. Secondly, to my employer, Endless, for the support they gave me to fix this issue. And last but not least, to the Ubuntu folks, which made a public call for testing with the changes – this will give us confidence that the fix is working, and that backporting it will be a relatively safe and smooth process. Explain in greater details what is the issue (or at least, what we think it is), the journey to find it, and how it was fixed. Give more exposure to important extra work from other contributors that absolutely deserve more credits. Expose a social issue that showed up during this time, and open a discussion about it. To me, it all started when I saw GitLab’s ticket #64 passing by in the IRC channels. It was challenging enough, I was curious to dig into GNOME Shell/Mutter/GJS internals, perfect match. Of course, when you’re not familiar with a given codebase, the first step to fixing a bug is being able to reproduce it, so I started to play around with GNOME Shell to see if I could find a reliable way to reproduce it. Well, I found a way and wrote a very simple observation: running animations (showing and hiding the Overview, switching applications using Alt+Tab, etc) was reliably increasing memory usage. Then a few people came in, and dropped bits of useful information here and there. But at this point, it was still pointing to a wide range of directions, and definitely there was not actionable task there. This is when OMG! Ubuntu first wrote about it. Carlos Garnacho then came in and wrote a pretty relevant comment with important information. It was specially insightful because he put numbers on the guts of GNOME Shell. His comment was the first real solid step to uncover what was going on. Well, as stated in the comment, GJS’ garbage collect was indeed collecting memory when triggered. Problem is, it wasn’t being triggered at all. That was the leading clue to one of the problems that was going on. One idea came to my mind, then, and I decided to investigate it further. Lets suppose that we decided that we don’t need the root object anymore, so we drop a reference to it, and it is marked for garbage collection. The garbage collector has no means to know the relationships between C objects. The garbage collector, then, will go there and destroy the root one. This object will be finalized, and the directly dependent objects will be marked for garbage collection. Only the directly dependent objects are marked for the next garbage collection. But… when will the next GC happen? Who knows! Can be now, can be in 10 minutes, or tomorrow morning! And that was the biggest offender to the memory leak – objects were piling up to be garbage collected, and these objects had child objects that would only be collected after, and so it goes. In other words, this is not really a memory leak – the memory is not being lost. I’d label it as a “misbehavior” instead. While people might think this was somehow solved, the patches that were merged does not fix that in the way it should be fixed. The “solution” is basically throwing a grenade to kill ants. We now queue a garbage collection every time an object is marked for destruction. So every single time an object becomes red, as in the example, we queue a GC. This is, of course, a very aggressive solution. But it is not all bad. Some early tests shows that this has a small impact on performance – at least, it’s much smaller than what we were expecting. A very convincing explanation is that the higher frequency of GCs is reducing the number of things that are being destroyed each GC. So now we have smaller and more frequent garbage collections. EDIT: Looks like people need more clarification here, since the comments about it are just plain wrong. I’ll be technical, and precise – if you don’t understand, please do some research. The garbage collector is scheduled every time a GObject wrapped in GJS has its toggle reference gone from >1 to 1. And scheduled here means that a GC is injected into the mainloop as an idle callback, that will be executed when there’s nothing else to be executed in the mainloop. The absolute majority of the time, it means that only one GC will happen, even if hundreds of GObjects are disposed. I’ve spotted in the wild it happening twice. This fix is strictly specific to GObjects wrapped by GJS; all other kinds of memory management, such as strings and whatever else, aren’t affected by this fix. Together with this patch, an accompanying solution landed that reduces the number of objects with a toggle reference. This obviously needs more testing on a wider ranger of hardwares, specially on lower ends. But, quite honestly, I’m personally sure that this apparently small performance penalty is compensated by the memory management gains. While the previous section covered my side of this history, there are a few other contributors that did a great job, and I think it would be unfair with them if their work was not properly highlighted. Red Hat’s Carlos Garnacho published two merge requests for GJS that, in my testing, substantially improved the smoothness of GNOME Shell. The first one changes the underlying data structure of JS objects, which allows us to stop using an O(n) algorithm and starting an O(1) one. The second one is particularly interesting, and it yields the most noticeable improvements in my computer. Gross, it vastly reduces the number of temporary memory allocations. He also has a number of patches on Mutter and GNOME Shell. Another prominent contributor regarding performance is Canonical’s Daniel van Vugt, which helped early testing the GJS patches, and is doing some deep surgeries in Mutter to make the rendering smoother. And for every great contributor, there is a great reviewer too. It would be extremely unfair if those relevant people haven’t had their work valued by the community, so please, take a moment to appreciate their work. They deserve it. At this point, hopefully the cautious reader will have at least a superficial knowledge on the problem, the solution, and other relevant work around the performance topic. Which is good – if I managed to communicate that well enough, by the time you finish reading this blog post, you’ll have more knowledge. And more knowledge is good. You can stop here if you want nothing more than technical knowldedge. As a regular contributor for the last few years, this kind of comment sound alien to me. These comments sound completely disconnected to the reality of the development process of GNOME. It completely misses the individuality of the people involved. Maybe because we all know each other, but it is just plain impossible to me to paint this whole community as “they”; “GNOME developers”; etc. To a deeper degree, it misses the nuances and the beauty of community-driven development, and each and every individual that make it happen. To some degree, I think this is a symptom of users being completely disconnected to GNOME development itself. It almost feels like there’s a wall between the community and the users of what this community produces. Which is weird. We are an open community, with open development, no barriers for new contributors – and yet, there is such a distance between the community of users and the community of developers/designers/outreachers/etc. Is that a communication problem from our side? How can we bridge this gap? Well, do we want to bridge this gap? Is it healthy to reduce the communication bandwidth in order to increase focus, or would it be better to increase that and deal with the accompanying noise? I would love to hear your opinions, comments and thoughts on this topic. A late night announcement: the improved tiling patches (shown in a previous blog post) were merged in Mutter and and GTK+3, and will be available in GNOME 3.26.1 / GTK 3.22.23 (not yet released; should be available this week). I’d like to thank Florian Muellner, Matthias Clasen, Jonas Adahl and AlexGS for all their support, time, code reviews and testing. I think that, at this point, at least a good part of the community is aware of the many new features that are planned to arrive with GNOME 3.26. I’m particularly looking forward a better tiling story in GNOME Shell and Mutter. Anyway, I can’t just sit down and keep waiting for something I could work on, right? This is obviously a work in progress. You can track the progress of this smarter half tiling in bug 645153. But, sssshhh don’t tell anyone, this is actually part of the future quarter tiling feature!